1982 ... L.A. Bieschke and R.E. Klingner · One of the newer types of composite bridge construction includes the use of precast prestressed concrete panels which span between longitudinal girders and act as formwork and base for the cast-in-place deck. · Publ. by: University of Texas at Austin. 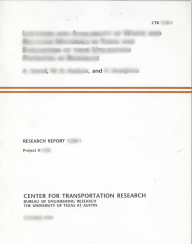 Center for Transportation Research (CTR). 1984 ... T.R. Overman, John E. Breen, and Karl H. Frank · This report summarizes the fatigue testing of full scale precast pretensioned girders with unshored cast-in-place slabs. It includes an extensive literature review of prestressed concrete fatigue and development of design specifications relating to fatigue of prestressed concrete.